Ratatouille is a French side dish located with Mediterranean vegetables. I decided to turn this healthy side into a salad with grilled vegetables and quinoa with this Grilled Ratatouille Salad recipe. This gluten-free and vegan recipe is perfect for a weeknight summer dinner or weekend lunch. I am actually serving this alongside grilled steaks this Memorial Day weekend. It’s three of my favorite things: healthy, flavorful and beautiful! I started getting together my Thanksgiving recipes, and put this Kale Pasta Salad on the list. It’s a cold salad (I know), but it pairs well with the holiday turkey. This has become one of our favorites with grilled meats and seafood. I even add grilled chicken to it, and the kids take it to school for lunch. It’s super easy, and it makes a lot so enjoy all week long. We hear about “Mindless Eating” often, and I speak about it often during my health and nutrition presentations. I was so glad to find out about Dr. Wansink, an expert in the psychology of food. In his book, “Mindless Eating, Dr. Wansink explores and trys to understand how small changes in people’s everyday food decisions can make a positive difference on their health. He is supportive of Unilever Food Solutions’ “Seductive Nutrition” approach. What is “Seductive Nutrition”? 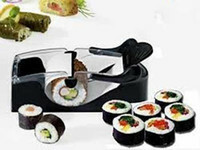 Dr. Wansink states, “It can speak to the holistic dining experience. Nice dinnerware, soft lighting and a matching tablecloth can help enhance a person’s dining expectations and is something to keep in mind for your next dinner party.” In his research, he found people rated the taste of a brownie much higher when it was served on a nice dinner plate than on a cheap plastic plate. Look how this broccolini looks more luscious in this photo (above). See health benefits of broccolini and the recipe for Broccolini with Pumpkin Seeds. Dr Wansink now wants to help industry professionals (bloggers, recipe developers, restaurant operators) and their dining patrons learn how quick, easy meal changes – whether dining in a restaurant or at home – can make positive impact on how people eat, and therefore how they live. The group at Unilever Food Solutions recently hosted a “select group of chefs and restaurant operators at the Culinary Institute of America-Greystone (CIA) to highlight their efforts to help people choose delicious, slightly healthier meals when they eat out through “Seductive Nutrition.” Developed by Unilever Food Solutions after the release of a global World Menu Report, “Seductive Nutrition” nudges guests to choose top menu items made slightly healthier through small changes to ingredients and preparation methods, with more enticing menu descriptions.” For example, my recipe for Checkboard Tuna Sandwich is more enticing by its name and its presentation. Research from his Cornell Food and Brand Lab, and his book show that we eat first with our eyes and imagination, and then with our stomachs. If we think something is going to taste good, it also tends to. Knowing this tendency, “Seductive Nutrition” may help make the healthiest of foods not only appear – but also taste – indulgent to your customers. 1. Geographic Labels: Use words to create an image or illicit the ideology of a geographic area that diners can associate with foods. Examples include Southwestern Tex-Mex Salad; homegrown Iowa Pork Chops; “Real” Carolina Barbeque Sauce; or Country Peach Tart. 2. Nostalgic Labels: Alluding to your customers’ past can trigger happy associations of family, tradition, national origin and a sense of wholesomeness. Use these fond associations to create appealing names, like Old-World Italian Manicotti; Grandma’s Best Banana Cream Pie; or Green Gables Matzo Ball Soup. 3. Sensory Labels: Describing the taste, smell and texture of menu items served can help set customer dining expectations. Dessert chefs accomplish this masterfully; example menu names include Velvet Chocolate Mousse; Silky-Smooth Pumpkin Pie; or Warm Apple Crisp. Sensory labels apply to all meal courses, such as Hearty, Sizzling Steaks; Snappy-fresh Seasonal Carrots; or Garlic butter-infused Chicken Kiev. For more information on Unilever Food Solutions, the “Seductive Nutrition” approach to menu development and the “Seductive Nutrition” Challenge, please visit www.unileverfoodsolutions.us. Disclosure: I received compensation for this post as part of a sponsored opportunity from the Mom It Forward blogger network for Unilever Food Solutions. All ideas, images and opinions are my own. It’s summer squash season, and now is the perfect time to prepare healthy side dishes using summer squash. This Summer Squash-Kale Sauté is one of our favorite side dishes, and it’s a breeze to make. Serve it with grilled fish, chicken or pork or any main dish. It’s even really fabulous stirred into some cooked thin spaghetti noodles. Summer squash is full of health benefits such as being high in Vitamin C, A, antioxidants, potassium, fiber and manganese. One cup of yellow squash contains 37 calories, 7 grams of carbohydrates and less than one gram of fat. Check out some other fabulous summer squash recipes as part of Summer Fest from the Food Network from some of my favorite blogs. I am such a huge fan of kale. It’s truly so versatile and filled with so many health benefits. Check out my recent article on MindBodyGreen on the “Top 10 Health Benefits of Eating Kale”. Spicy Kale Slaw was on the menu last week at Award Winning Chef, Frank Stitt’s, Highland Bar and Grill restaurant in Birmingham. It was so fabulous that it inspired me to come up with my own. I use a Dijon vinaigrette to flavor mine and added shredded carrots, broccoli and toasted walnuts. Sometime it feels like sides dishes get left out, and people ask me all the time for side dish ideas. These Stuffed Potatoes are low-fat and easy to make. The touch of Greek Yogurt and Gruyere add great flavor and texture. They go perfect with meat, fish or pork, and best of all, the kids love them. See me on Thursday 11:30 central time on NBC 13 “Daytime Alabama” making a few of my favorite side dish recipes. Whether I am having Thanksgiving dinner or just a weeknight meal, I like to prepare asparagus by simply roasting it in the oven. It comes out crisp-tender, and the flavors intensify perfectly. Be sure to cover the baking pan with aluminum foil, spray it with cooking spray and cleanup just got to be even easier. If you don’t like pine nuts or have guests who are allergic to nuts, just substitute almonds or pecans or eliminate them from the recipe. To me less is more with asparagus, but feel free to top this recipe with a squeeze of lemon or lime juice or even crumbled feta or goat cheese. Asparagus is full of vitamins such as Folic Acid, Vitamin C and Potassium, so enjoy. 1. Snap off and discard tough ends of asparagus; place asparagus on a lightly greased baking sheet. Drizzle evenly with olive oil; sprinkle evenly with garlic, salt, and pepper. 1. Bake at 350° for 10 minutes or to desired degree of tenderness, tossing gently half-way through cooking time. 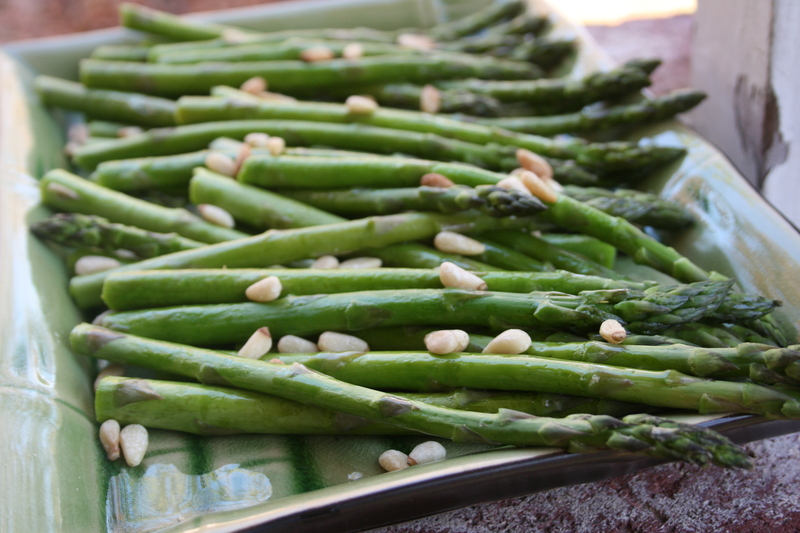 Transfer asparagus to a serving dish; sprinkle with pine nuts.